Puncture pads have two spinal cord depths. 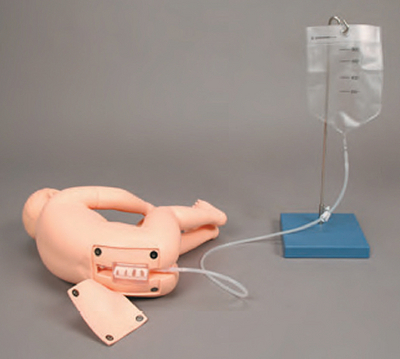 Practice delicate lumbar injection procedure on young patients using this advanced lumbar simulator specially designed for pediatric training. Featuring three puncture pads that mimic response of actual skin types, students can collect CSF fluid and measure CSF fluid pressure under clinically realistic conditions. A transparent puncture block allows direct observation of the anatomy and path of the spinal injection needle. Includes a separate anatomical model of the lumbar spine to facilitate understanding, and can be used in either lateral or sitting positions. Also includes a thorough guidebook to the relevant anatomy, physiology, indications and performance of the lumbar puncture, and a guide to CSF fluid analysis and LP risk management.